I don’t believe curiosity kills cats. If anything, curiosity fuels life. It inspires learning, and nourishes personal growth, and acceptance. Curiosity fosters exploration, challenges perceptions, and dismisses fears. It’s a beautiful thing. In his quest to fulfil his own curiosity, self-proclaimed nerd, Mikey Muhanna, is inspiring others to do the same with an uplifting initiative that’s quickly spreading among Arabs (and their friends) around the world: Afikra. A play on words meaning “by the way” or “a thought,” Afikra is now taking on a new meaning as monthly salon-style events, featuring presentations on just about any Arab related topic. 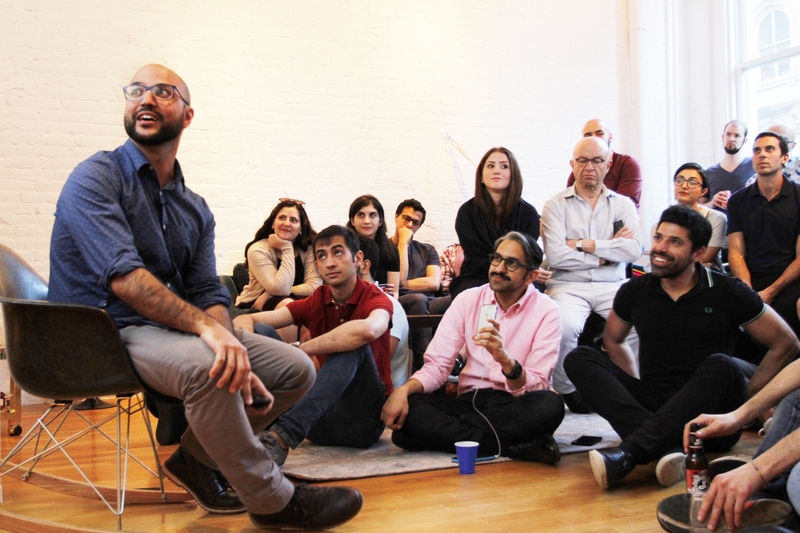 A few years ago, Muhanna, who then lived in New York, realized that his interactions with other Arabs came in two forms: weddings and other celebratory events, or politically-driven gatherings, like protests and lectures. Feeling as though no one talks about the region’s rich culture and fascinating stories, he wanted to do something different within his own circle. On a Brooklyn rooftop in September 2014, he gave a talk to a few friends on a topic related to the Arab world. They enjoyed it so much that they voted to make it a regular thing. 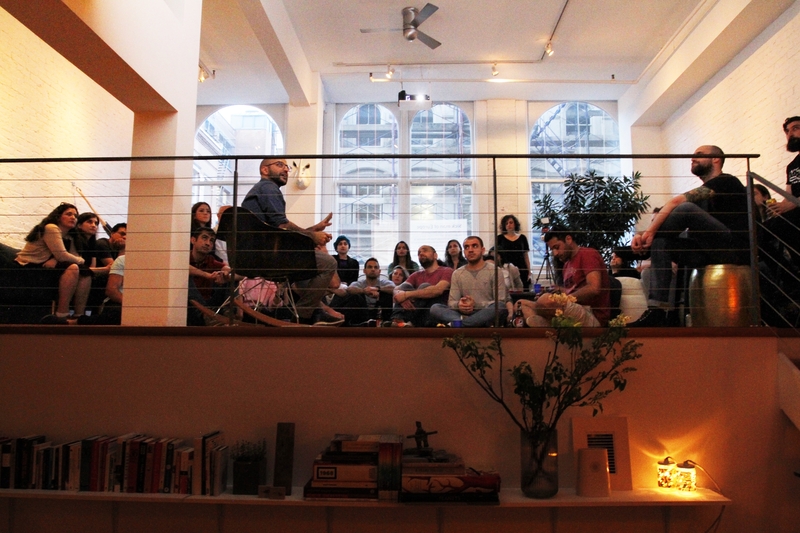 Muhanna made sure the gatherings were explicitly non political, and not parties, creating a new intellectual space for encouraging curiosity for its own sake, where inquisitive minds could explore a collective stream of questions about the Arab world. With the help of other team members, Afikra slowly took shape, bringing fascinating subjects to light, cultivating genuine curiosity, and creating a sense of community. “We’re asking, and trying to answer, interesting questions, without trying to convince anyone of anything,” Muhanna says. Within its first year, Afikra flourished beyond expectation. “We were outgrowing living rooms, and it got to the point where people from other cities were coming to attend these events,” says Muhanna. At that point, he decided to institutionalize the concept, laying down some ground rules. There’s only one prerequisite to giving a talk: a person has to have already attended at least one event. Muhanna and other volunteers on the team work with presenters (who are nominated or have applied online) on choosing topics, solidifying questions, developing ideas and presenting. Speakers and attendees don’t have to be Arab, but the topics do. Presentations are filmed and archived online. As it turned into a well-oiled machine, Afikra was exported to other cities and the team expanded to almost 20 volunteers. February 2016 saw the first event outside New York City, in Washington DC. When Muhanna’s work had him relocate to his native Beirut in 2016, he was faced with the question: “Will an organization dedicated to Arab culture work in the Arab World, or is it just an expat thing?” But the talks proved just as popular on this side of the globe. Now in its third year, Afikra has five chapters, (New York, Washington DC, Montreal, Beirut, and Dubai) and six more in the making (London, Boston, Kuwait, Bahrain, Amman, and Los Angeles). The growth rate is only increasing worldwide: “We’ve had 100 topics since inception. This past year there were 60, so there have been more talks in the last year than the first two years combined,” Muhanna says, predicting further increased growth. He has tons of ideas for what’s to come, from a larger online presence, bigger events, and geographical expansion to more cities, as well as pop-up events (like the first one in Singapore). Ultimately, the intention is to keep the events free, which is why the organization had its first crowdfunding campaign last year, raising $15,000. However, Afikra is not just a society of intellectuals, and goes beyond a few friends, or even strangers, meeting for monthly nerd-fests — Afikra has much more far-reaching implications. Yes, curiosity opens minds, and this is already a much needed exercise, but even more importantly, Afikra’s focus on Arabness contributes to global conversations on exactly the kind of topics we need to associate with being Arab. As the world’s current antagonists, Arabs must remind at least themselves of their identity, history, and heritage. Afikra is getting people to talk about our intellectuals and artists, our facts and findings, our myths and memories. 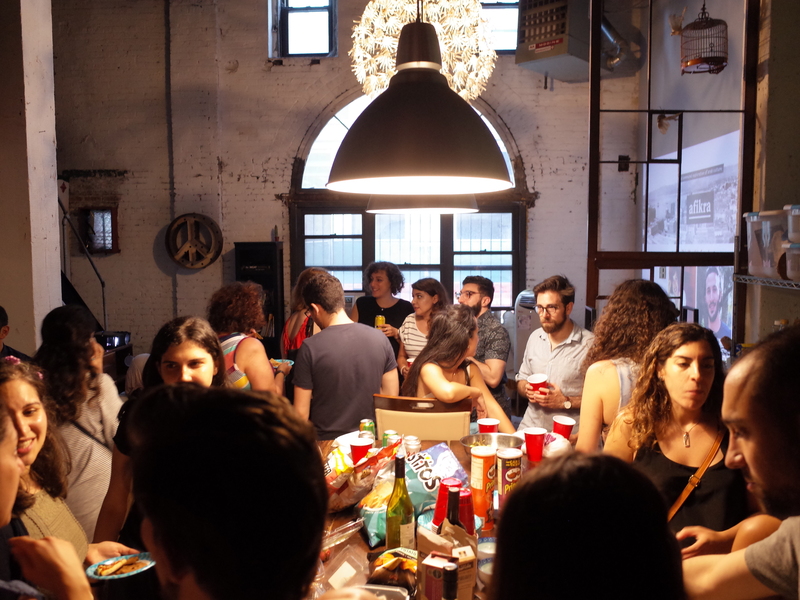 Rather than just partying together, or being angry together, Afikra encourages Arabs to think together — and this is just the nourishing food for thought that we’ve been starving for. This Sunday, June 18, is Afikra’s last event of the 2016-2017 season at Dar El Nimr, with two surprise new talks, after which events will resume in August.